There are hundreds of charming small towns in Italy—but the towns in Tuscany, Umbria, and Italy’s other central regions are some of the most beautiful (and interesting!). Need to be convinced? Here are ten of our favorite small towns in central Italy, in photos… ranging from a foodie’s paradise to a spa-lover’s heaven. (And don’t miss our previous posts on the best towns in southern Italy and on the top ten towns in Tuscany!). Which one is your favorite? Let us know in the comments! 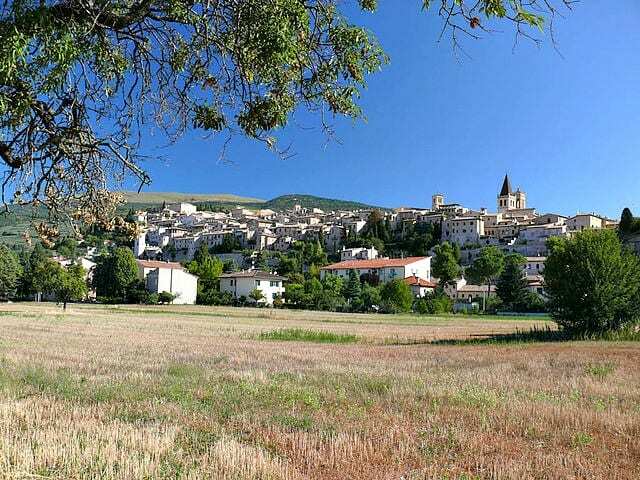 Located in southwest Umbria, Norcia isn’t just lovely. It’s also renowned for its tradition of curing pork products—so much so, in fact, that a shop selling cured meat often is called a “norcineria!”. 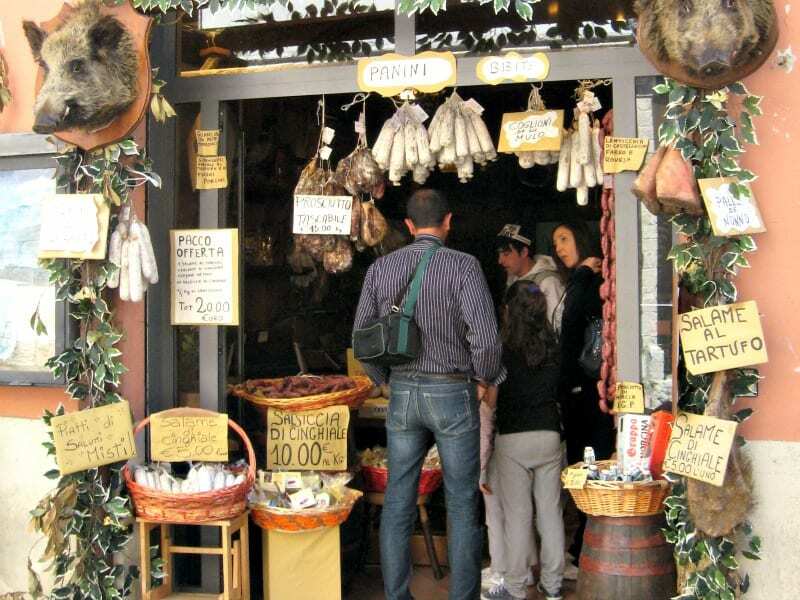 Walking through Norcia’s streets, visitors often stop in their tracks to marvel at the variety of cured meats hanging outside the shops. Add prized black truffles to Norcia’s repertoire, and it’s no surprise that this small town in Umbria is a gastronomic delight. Enclosed by an impressive 14th-century wall, Norcia isn’t just rich in food, but history. The birthplace of St. Benedict, Norcia’s main piazza is graced by the saint’s statue. Also on the square, don’t miss the lovely the town hall or the Basilica of San Benedetto, built on the ruins of a Roman building and, supposedly, the home where San Benedict was born. Spello is located less than eight miles from Assisi. But, especially compared to its famed neighbor, Spello is seriously off the beaten path. Stone houses line Spello’s winding alleys, their balconies adorned with flower pots. But as well as picturesque, Spello is historic: Dating back to ancient Roman times, the town is encircled by medieval walls. And to get to the centro storico, you’ll probably take the main entrance, Porta Consolare, which just happens to be an ancient Roman gate. Make your way up Via Cavour and step into the Church of Santa Maria Maggiore, which boasts remarkable frescoes by the Italian master Pinturicchio. Yes, it’s a steep climb to the top of the town. But the sweeping views of the Umbrian countryside make it more than worth the effort! 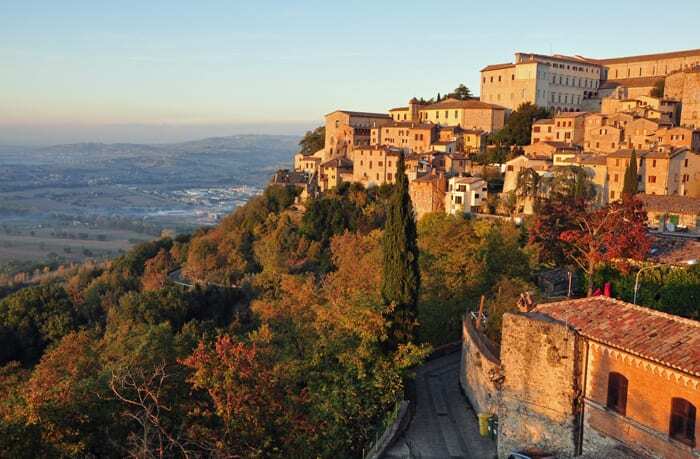 Located smack in the center of Umbria, Todi makes the perfect base for exploring the region—often called the “green heart of Italy. (Don’t miss our post on more of our favorite spots in Umbria!). Surrounded by Etruscan, Roman and medieval walls, this picturesque hill town in Italy has, you guessed it, a lot of history… and sightseeing options. Built in the 13th century to rival Orvieto’s Duomo, Todi’s church dedicated to San Fortunato, Todi’s first bishop, was eerily left unfinished due to lack of funds and the plague. Just outside the center, the church of Santa Maria della Consolazione is one of Umbria’s best examples of Renaissance architecture. (Some think the master Bramante even had a hand in its design, although nothing’s for sure). And Todi is the birthplace of Jacopone, a famed Franciscan poet. Architecture and history aside, there are a ton of beautiful views in Todi, too. Our tip: Take the funicular up to the town and visit Giardini Oberdan for striking, panoramic views of Todi and the rolling Umbrian countryside. 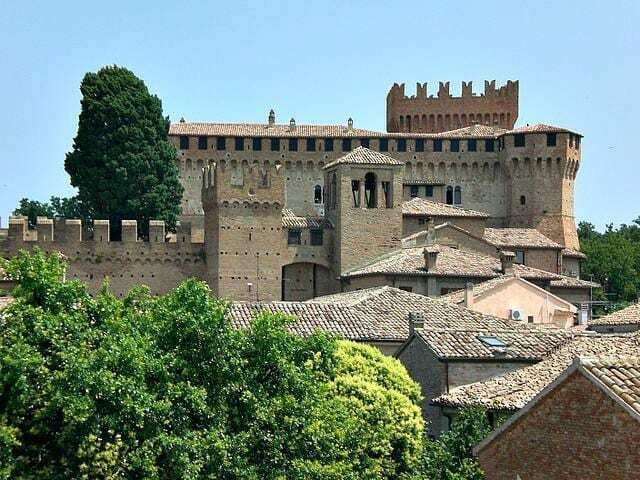 Lying on the border of Le Marche and Umbria, Gradara’s biggest claim to fame is its imposing castle. The town is also well-known for providing the setting for the tragic romance between Paolo and Francesca in Dante Alighieri’s Inferno. While Gradara is serene and tranquil today, that wasn’t always the case. Control over the hill town was fought over by various noble families—which is why it’s encircled by not one, but two, medieval walls. Today, the town hosts cultural events that relive its rich medieval past, from opportunities to taste medieval cuisine to participate in sword fighting classes . 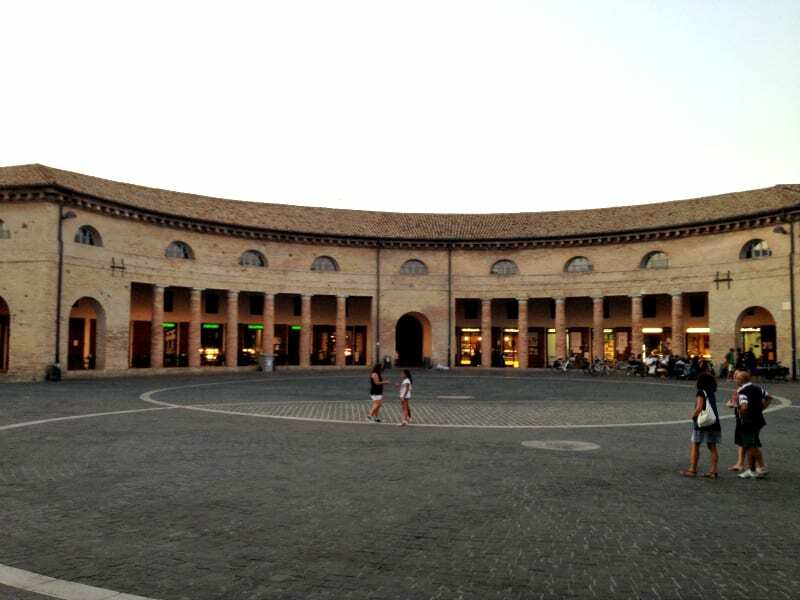 The circular Foro Annonario in Senigallia is today a main venue for summer concerts. Senigallia, located in the region of Le Marche, boasts an 8-mile stretch of golden sand and clear, shallow waters to lure visitors (most of them from Italy and Europe). As well as a popular seaside town, Senigallia also is home to some impressive historical buildings. The fortress, Rocca Roveresca, is massive structure for a relatively small town. As well as serving as the town’s stronghold, it was the headquarters of an important artillery school, prison, hospital and, finally, orphanage. Today, it hosts exhibitions and cultural events. And in front of Rocca Roveresca is Piazza del Duca, with its lovely fountain, Fontane Delle Anatre (Fountain of the Ducks), built in 1599. Don’t miss the Foro Annonario, a remarkable circular structure built in the 19th century with its 24 Doric-style columns. Today, the Foro is home to shops and restaurants. It’s also a popular stage for summer concerts. Located in Abruzzo, a region that’s often off the radar for most visitors, Caramanico Terme is a lovely medieval hill town that’s been known for the healing properties of its springs since the 16th century. In recognition of this, the word “Terme” was added to its name in 1960. 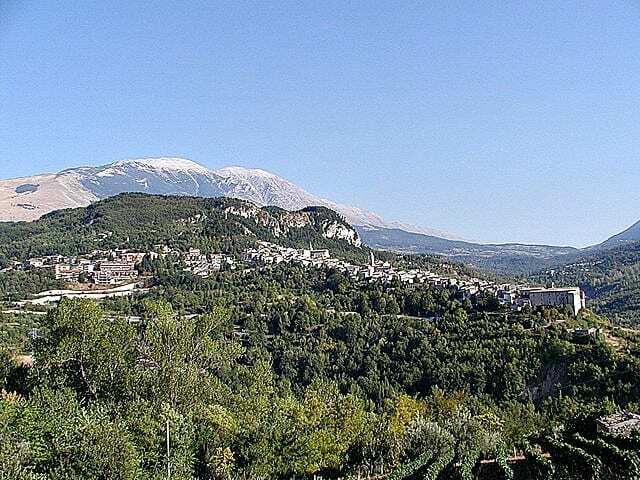 With its close proximity to ski resorts, and situated in the heart of the Majella National Park, Caramanico Terme is the perfect destination for nature-lovers in winter as well as summer (don’t miss our post on other green travel options in Abruzzo!). Also worth visiting: the Romanesque church of San Tommaso, with lovely 13th-century frescoes. 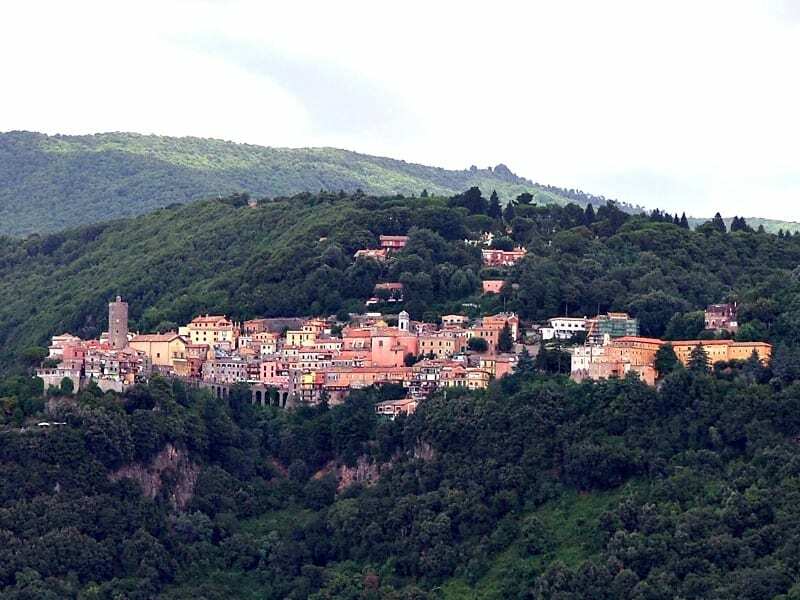 Located 20 miles from Rome in the area known as Castelli Romani, Nemi’s the perfect day trip from the bustling city. It’s also the site of some serious archaeological finds. In Lake Nemi, the volcanic lake below the town, archaeologists salvaged two opulent ships built by Emperor Caligula. Found in 1929, these wooden ships, adorned with glass mosaics and elaborately decorated, were housed in the Museo delle Navi Romani; sadly, a fire destroyed them in 1944. Today, the museum houses the scale model of the ships and a replica of one of the hulls. Another fascinating find in Nemi: a vast complex dedicated to Diana, the goddess of hunt, as well as a section of the Roman road, the Via Sacra, that led all the way to the Roman forum. (Looking for more day trips from Rome? Here are other great hidden gems in Lazio!). 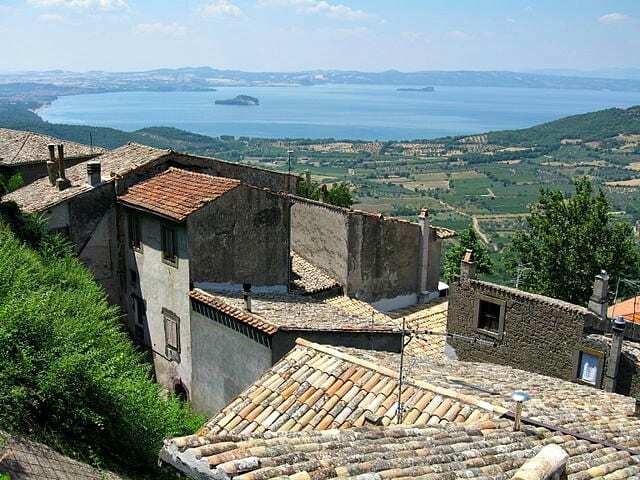 In northern Lazio, Montefiascone, rising more than 2,00o feet above sea level, offers a fabulous view of Lake Bolsena and the surrounding valley. (The vineyards in the neighboring countryside, in fact, are known for producing the famed Est!Est!Est! wine). This idyllic town’s history is closely tied to the Via Cassia, a central road that ran from France to Rome—and passed through Montefiascone. The town was also a popular summer getaway for Pope Leo X.
Don’t miss the stunning Cathedral of St. Margherita: Its massive dome is the third-largest in Italy, after only St. Peter’s and Florence’s Duomo. Set on one of the most evocative landscapes in southern Tuscany (don’t miss our post on 10 more beautiful towns in Tuscany), San Casciano dei Bagni has been known for its thermal springs since the Etruscan times. Boasting 42 springs, it is considered one of the largest thermal bath complexes in Europe; today, it’s home to the luxurious Fonteverde spa. For the most unique thermal experience, head to the bottom of the town and soak in the ancient baths of Bagno Grande and Bagno Bossolo, filled with 40° C (104° F) water and surrounded by nature. Once you’ve soaked, a stroll through the charming medieval town is a must. Make your way up to the main piazza, Piazza Matteoti, and take in the splendid views. You’ll also see the town hall decorated with various coat of arms of previous government officials, and the town’s main church, the Collegiate Church of San Leonardo, dating back to the 13th century. 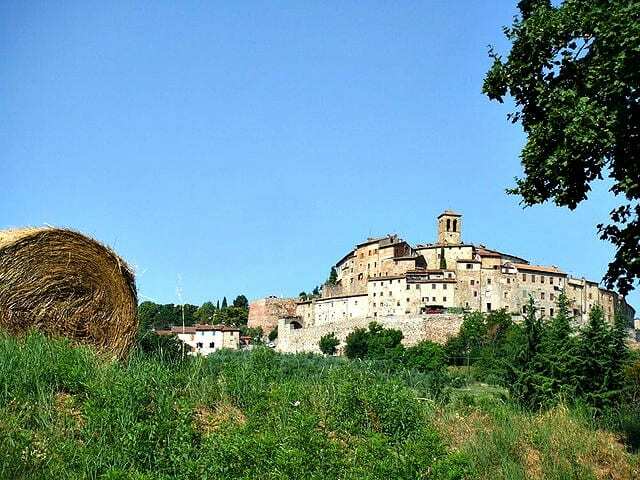 A charming walled town in Tuscanty, Anghiari boasts incredible views of the Tiber Valley. A battle fought here in 1440—the Battle of Anghiari—also inspired a fresco painted by Leonardo da Vinci in Florence’s Palazzo Vecchio. Walking through the town’s narrow alleyway, you might just feel like time has stood still! As well as soaking in the town’s sense of timelessness, make sure to visit Anghiari’s Piazza Mameli, home to two museums, Palazzo Taglieschi and Palazzo del Marzocco. Have you visited these small towns? Which are your favorite towns in central Italy? Let us know in the comments below! I never need convincing when it comes to exploring Italy! I’ll be visiting Rome and Florence for the first time this fall. After reading this, I’m definitely considering Nemi as a day trip. Thanks! My list just got longer! Great reviews of these little known spots. 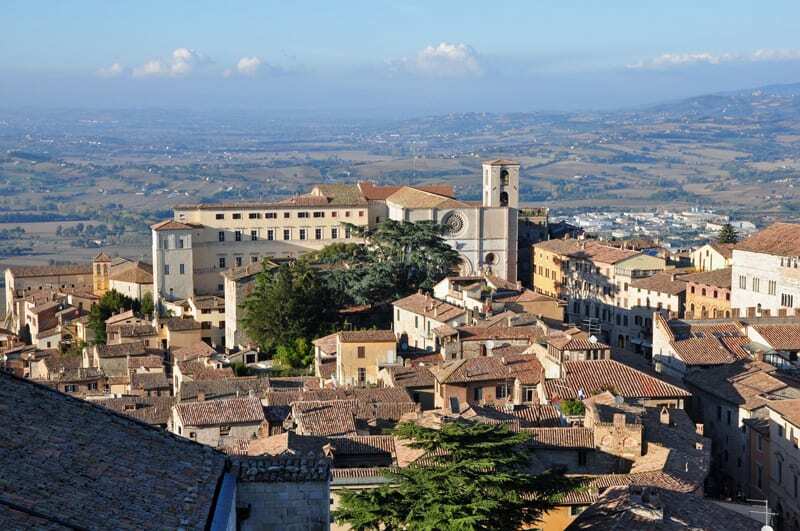 There are a lot of wonderful small towns, but my favorites are Assisi and Orvieto! Montepulciano is beautiful aswell! What a fantastic site! Beautiful photography and great descriptions. Thanks! Lanciano, Abruzzo is a very beautiful town with a ton of character and gives you the feel of a little italian town. I spent a month there and it was amazing!